The first time I left to go traveling, I had saved about $10,000 and was ready to live off of that for an entire year. While I know that budget wasn’t massive, especially since my first stop was in Europe, I was determined to make it work. With that budget, I managed to travel all over Europe, the US, and all over Southeast Asia, in what I can only describe as a whirlwind of a year. I was on a budget but I still managed to see and do everything that I wanted, it just took a little ingenuity and resourcefulness. Eight months after I returned from my big trip, I decided to leave again, this time, with only $2000 to my name. 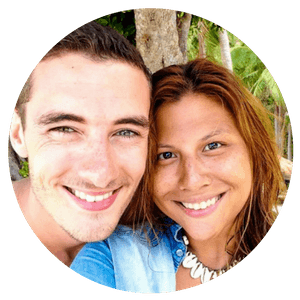 Armed with big dreams, this blog which we just started, and not much money (at least on my end), my partner Tom and I left for Indonesia with no particular plans except we wanted to grow our blog and travel the world. Fast forward to today…we’ve been working and traveling the world for almost three years non-stop. Want to know how you can do it too? 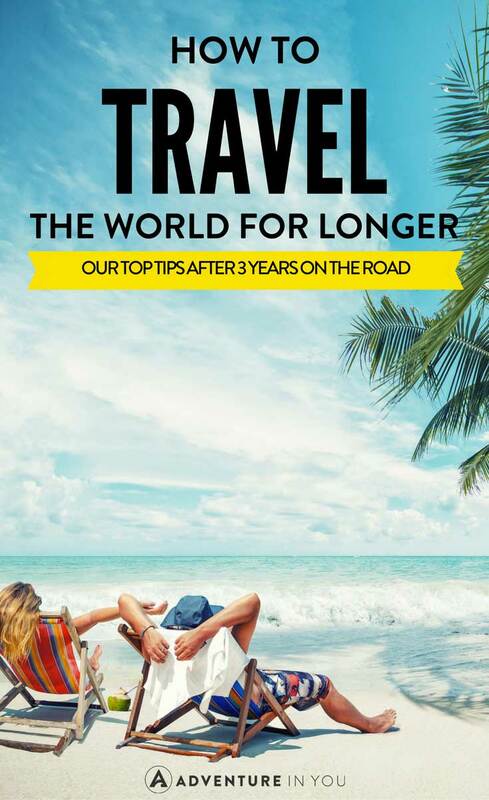 Here are a few of our top tips to help you travel the world for longer. Tom teases me a lot calling me the stingiest person he knows. For example, in my backpack, I always have instant coffee or bags of tea stashed in the side pockets just so I don’t have to spend $3 on a cup of coffee. I budget endlessly and try to save money in every way I can. While we have a steady flow of income coming in from our blog, being thrifty has helped me stay on the road for longer. Remember though, there is being thrifty but there is also being cheap and being impractical. I would never NOT leave a tip as I appreciate the hard work that people in the service industry do. I would also never sacrifice not eating well just so I can save a couple of bucks. There is a line between beings stingy and being uncomfortable and unhappy. When traveling, think of cutting out little expenses and you will be surprised at how they add up in the end. When on the road, especially if we are in one place for a long time, we always rent places with kitchens so we can save money instead of eating out all the time- plus cooking at home is a lot healthier too! See the photo of me below? 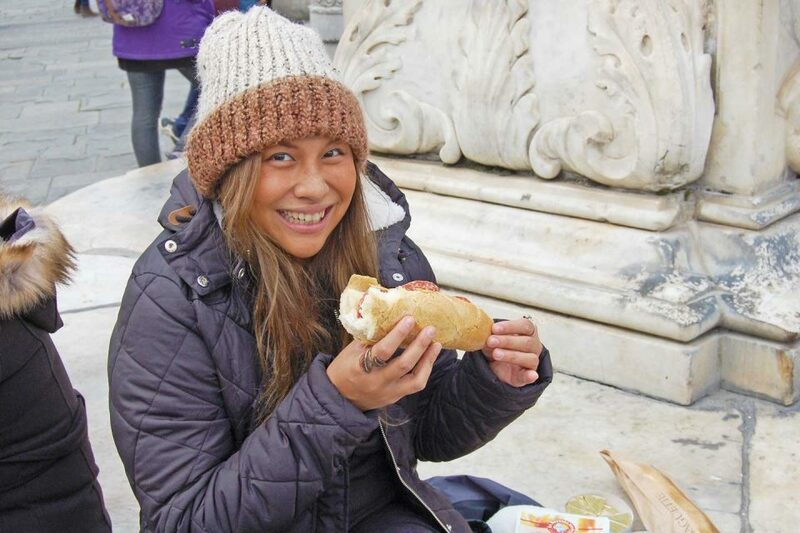 That was me eating a sandwich near the Leaning Tower of Pisa. Instead of spending $6-7 each for a meal in a restaurant, we went to the local grocery and bought bread, cheese, and prosciutto. BOOM, $2 lunch for two. When traveling, transportation is usually always the biggest expense. While you can easily get by in countries like Thailand for $20 a day, the flight to get to Thailand is another story. Thankfully, the internet has TONS of articles on travel hacking and how you can find great deals. Nowadays, you can even fly for practically free thanks to air miles and credit cards. However, our personal secret to booking cheap flights and scoring amazing deals is scouring flight comparison sites like Skyscanner. Through Skyscanner, we’ve managed to get $30 flights to Amsterdam, $800 flights to the USA and South America and other ridiculously crazy deals. We’ve also booked tickets on a whim using their Fly to Everywhere and map feature. The app also has lots of good deals, especially when finding cheap flights from the US to Europe. Editor’s Note: Download the SkyScanner App and you’ll see what I mean about cheap flights! Another way to stay on the road for longer is to look for alternative ways on how to travel. Websites like Couchsurfing, Wwoofing, Trustedhousesitters.com, Mindmyhouse.com have become the new trend to help make travel more affordable. For a place to sleep at night, you can volunteer your time by working in a farm, entertaining your host (I always cook for my CS hosts), or even volunteering to take care of pets! The internet and modern day technology has helped make travel so much more affordable! My point is, get creative when it comes to stretching out your budget. If you want more information and tips on what tools and websites we use, you can check out our travel resources page which is a list of all the companies we use on a daily basis. We have friends who have traveled all over the world saving thousands and thousands of dollars on accommodation all by housesitting! Traveling long term is the perfect time to develop and learn new skills. Are you a great photographer? Why not trade your time and approach hotels and hostels? Speak to restaurants about taking drool-worthy food shots for menus in exchange for meals. Are you a good graphic designer? Approach hostels and offer to re-do their website for free accommodations. As soon as we started traveling, both Tom and I have taught ourselves various skills which we think would eventually come in handy. I taught myself social media management, writing, and digital marketing. Tom has taught himself how to code, manage websites, sales and email marketing. Together, we used these skills to start a travel blog. Fast forward to today, our blog now brings in six figures a year, allowing us to work and travel anywhere in the world! If you want to know more about how we get paid to travel or how we make money online, you can also take a look at our income reports for some inspiration. While traveling is meant for seeing the world, it is also about self-discovery and trying to be the best version of yourself. Pick a skill that you are interested in and teach yourself everything and anything that there is to know about it. Take it to the next level and use those skills to help leverage you complimentary stays and meals. 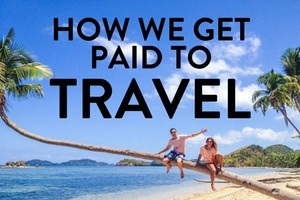 Do you want to get paid to travel? 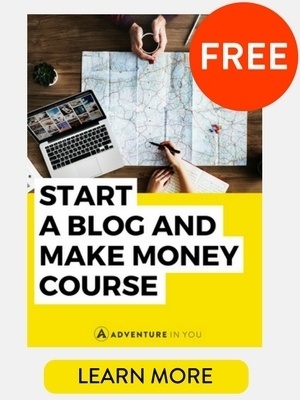 Join our FREE masterclass training where we will tell you exactly how we me make a full time income from travel blogging! The biggest secret to be able to travel for longer is to learn how to travel slow. Be flexible with your travel dates and look at alternate routes. Opt for buses, slow boats, and van rides instead of quick flights. While it is most often than not convenient, traveling is about the journey getting to one place…so yeah, that includes long 30-hour bus rides. When it comes to flying, get creative. Add stopovers, check the prices of one-way tickets, look at alternative airports. We also realized that it’s actually cheaper to stay in a place for longer rather than just breezing through. To this date, we’ve lived in Indonesia, Thailand, Philippines and Ecuador. In each place, it was cheaper to rent an apartment for a month rather than just stay for a couple of days. 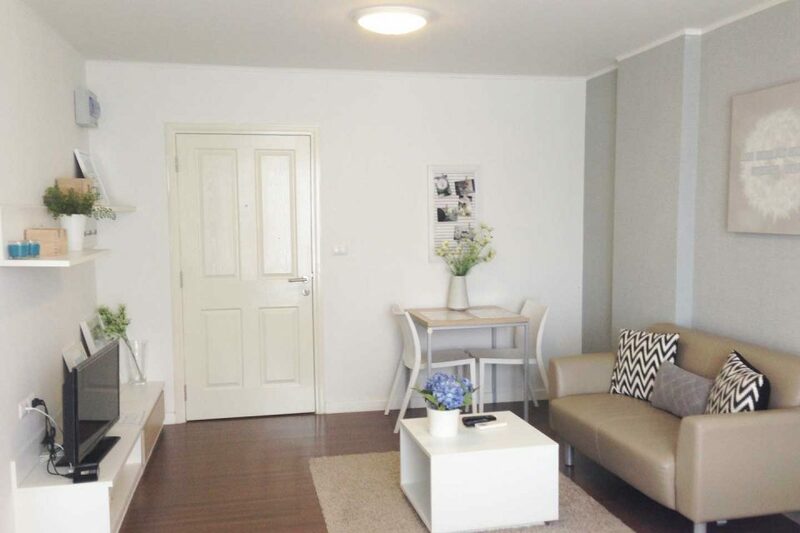 In Chiang Mai, our apartment (in the photo below) costs a whopping $230 a month. While $1000 will probably last you a month in Europe and North America, it can last you two months in Asia. If you’re really tight on money and want to travel for longer, choose your destinations based on their affordability. Spending less time in big cities and exploring lesser-known off the beaten path places can also save you heaps of money, allowing you to stay on the road for longer. Planning your trips around budget destinations just helps make sure that you won’t be scrimping on every single penny. Another big expense that you can save on while traveling are tours and activities. While I would never say scrimp on these things as they are all part of the experience of traveling, be smart about it! Make the most out of free walking tours, hikes around the area, free diving, snorkeling, walks on the beach, etc. There are so many free activities that you can do in each place that you will barely feel like you are missing out. In all honesty, we are very lucky in this end as we usually collaborate with various companies to go on various adventures thanks to our travel blog. In return, we provide them with honest reviews and coverage on our site. This works well for the companies as we do our best to promote and market them and it works well for us as we get to go on awesome free adventures (like paragliding, trekking through the Amazon Jungle, and even scuba diving with sharks!). When on the road for a long time, learn how to get around on basic travel expenses. Pack light so you don’t have to spend on airline luggage. Learn the public transportation system instead of taking taxis everywhere. Eat street food over meals in restaurants. Take advantage of free museum days and activities. Make friends with locals and find out ways on how they save on money! If you want to travel for longer, another top tip is to have the right mindset. Be willing to get creative and resourceful, and put yourself out there. Long-term travel isn’t for everyone, that’s for sure. 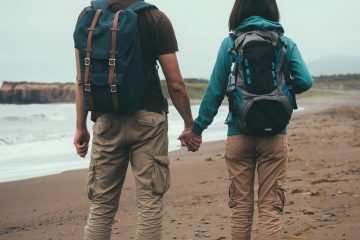 But if you ever find yourself bitten by the travel bug with no intentions to stop, stretching out your budget and finding ways to travel for longer is possible! Last but not least, while this probably deserves an entire post of its own, the only reason why we have been able to travel for this long is because we were also working along the way. For us, it was this blog that kept us traveling, but it doesn’t mean it has to be the same for everyone. Some people work in hostels, other people teach English, others have blogs, others work as yoga teachers. Believe it or not, there are a million and one ways to make money while on the road. 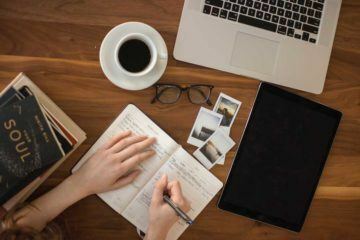 Working while you travel will not only help extend your travel budget but will also help you improve and learn skills you didn’t even know you had. When we first started this blog, we knew nothing about blogging, websites, and the online world in general. Now, we have employees working full time for us and we are also about to launch our app, Get Stoked! Our blog now brings in anything from $12,000+ a month, allowing us to comfortably travel and work from anywhere in the world. Not only has starting a blog changed our lives (turning us into start-up owners and entrepreneurs) it has also helped us travel for longer. If you want to learn how to start your own blog, check out the link below! 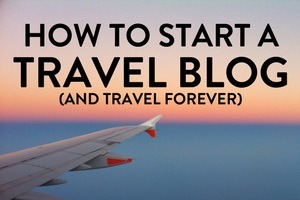 We have created a step-by-step guide to help people like you start your own blog. 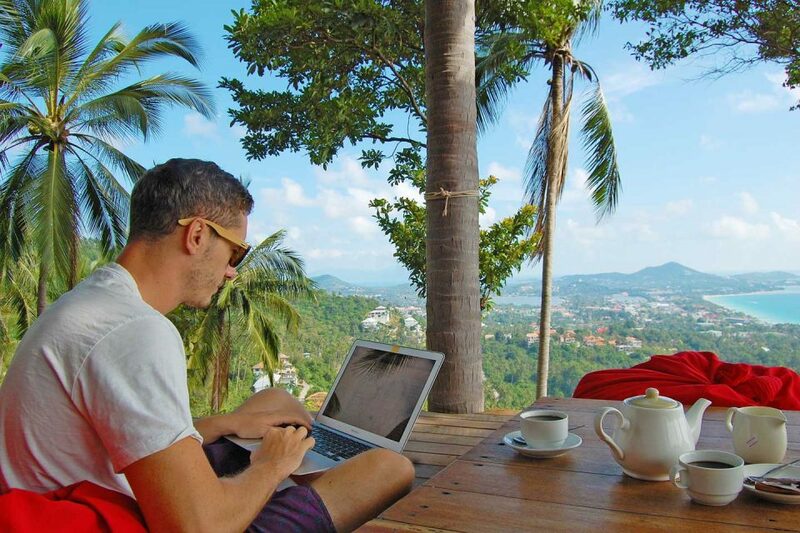 Nowadays, as long as you have a computer, you can freelance and work from anywhere in the world. Places like Fiverr allows you to do menial tasks like editing, translating, and even basic graphic design. Etsy, Society 6 allows you to sell handmade items and prints from anywhere in the world. 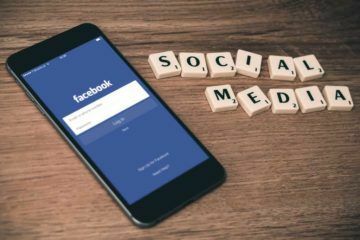 If you like social media, you can also consider becoming a VA and managing various social media accounts for blogs and brands. 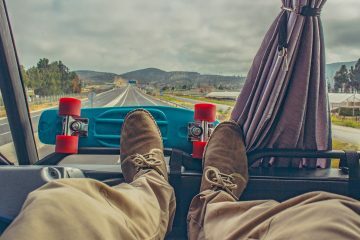 After reading books like the $100 start up or the 4-Hour Work Week, you will be amazed to see how easy it is to actually start your own business- even while traveling on the road! In Chiang Mai, most of the people there work online and you will be AMAZED at the variety of jobs that they do. From selling e-books, digital courses, drop shipping, etc. My point is, diversifying and finding another income stream is not as hard as you think. P.S. I’m going to put a shameless plug here and say we just launched our own Adventure Guides to Southeast Asia. We are BEYOND excited- go check it out! Hopefully, you’ve picked up a few good tips or two to help you travel for smarter, cheaper, and longer! See you on the road. Do I Travel to Escape Life? My travel budgetting friend Danielle always says it’s about having the right mindset. I agree with her and you. The last time I was stingy with food abroad I ended up sick. Lol. That being said buy groceries is one of the best way to save money. 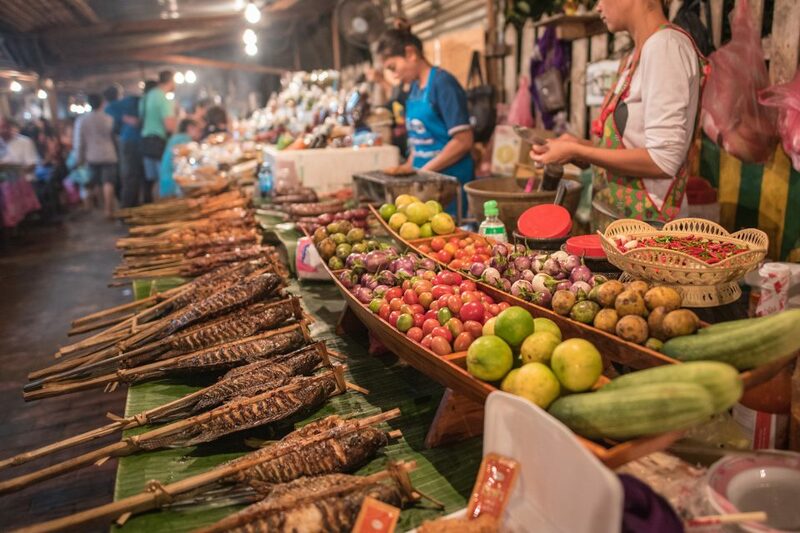 Of course you want to try local dishes but if you can make most of your meals yourself you can save a lot of money. These are fantastic tips!!! I love this post! I think anyone new to traveling (or even the experts) can find some inspiration here. It’s so cool that you guys managed to teach yourselves useful skills while on the road. Great job! Great tips! I hear ya on the cook your own meals thing. We recently road tripped for 2 weeks in Iceland, which is known for being a super expensive country. Cooking mostly all of our own meals helped keep our budget down in a big way! Love all your tips! Being flexible with travel dates is extremely important! I agree to take advantage of free activities and tours when it is available. This has helped me a lot whenever I travel! Good solid tips! I would like to add couple more. 1. When looking for airfare, check airlines websites too. Sometimes, they run some crazy promotions that could be missed by aggregators like Skyscanner or Momondo. 2. When looking for accommodations, choosing neighborhoods outside of tourist areas saves tons of money. For example, we just spent 3 months in Penang where we lived in a small town where apartment prices were 1/3 or less of what a comparable place costs in George Town. The food was much cheaper too. An average cost of our dinner for two was about $2USD. I like your tips because they are practical and make a lot of sense. One of the things we always try to do is get a kitchen because it really saves a lot of money especially if food in the country you are visiting is expensive. Wow, good for you, being able to travel the world for only $10,000. That’s awesome!! Nothing wrong with being thrifty. Why pay more when you don’t have to. 🙂 LOVE travel hacking – been doing it since 1994 (yep, I’m old). Great tip about Couchsurfing and WWoofing. Traveling slow is the key to saving a lot of money. It’s harder when you can only take short trips. Some good tips here, I was already familiar with pretty much all of them but it was nice to get some more insight into them – like I was stoked to find out you managed a full year of travel in even Europe and North america with such a small budget! 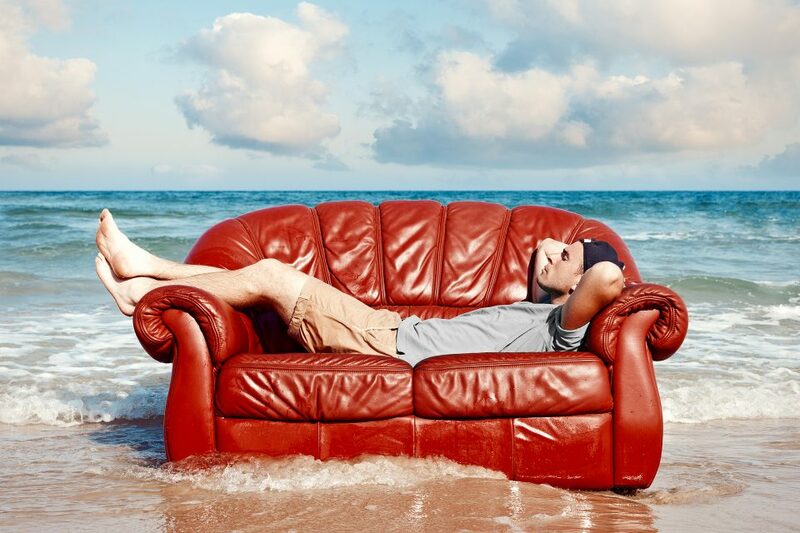 Were you able to travel somewhat comfortably? One thing though, I would never recommend using Fiverr. I’m getting an education as a translator and I did not go to university for five years and get a Master’s degree just so that some starving backpacker can make a few bucks off work that they have no clue how to do. And as I’ve understood it, most jobs offered on Fiverr are stuff like that – editing, graphic design, voiceovers… – that people actually went to school to learn, and by asking such a low price for your labour, these people on Fiverr drag down the already low prices on these fields. How am I supposed to make a living when places like Fiverr degrade the value of my hard work? Please, don’t call it “menial” work – you’d be surprised to know how much work goes into it. Yes, I managed to see and do everything that I wanted in Europe, including eat my heart out in Italy! 🙂 Just saved on other things like accommodation. It’s a matter of being flexible, look at a variety of options and research, being able to freelancer take a job with you on the road also makes it very doable especially when costs can be curbed abroad. Great tips! Since a few months I’m also travelling with tea bags and instant coffee! I also normally cook most of my meals! It really does make a difference! Awesome tips! I’m with you on being stingy, I’d rather spend my money on travel, not little things!